Silas Mercer PARKER "Sr" [Parents] was born on 5 May 1804 in Duck River, Elbert, Georgia or, Bedford, Tennessee. He died on 19 May 1836 in Fort Parker, Grosebeck, Limestone, Texas. Silas married Lucinda "Lucy" DUTY on 31 Aug 1824 in , Clark, Illinois. Lucinda "Lucy" DUTY was born about 1796 in Of, , South Carolina. She died on 19 May 1836 in Fort Parker, Grosebeck, Limestone, Texas. Lucinda married Silas Mercer PARKER "Sr" on 31 Aug 1824 in , Clark, Illinois. F i Cynthia Ann PARKER was born in May 1825. She died on 28 Oct 1864. M ii John Richard PARKER was born in 1825. He died in 1915. John Dan PARKER was born in 1830. M iv Silas Mercer PARKER "Jr" was born on 4 Jun 1833. He died on 19 May 1836. Arlene PARKER was born about 1834 in , Grimes, Texas. F vi Orlena PARKER was born on 1 Jan 1836. She died on 23 Jul 1863. Chief Peta Peutochonne NOCONA [Parents] was born in 1812 in Waco, McLennan, Texas. He died after 1864 in Antelope Hills, Jack, Texas. Peta married Cynthia Ann PARKER in 1844 in , , Texas. 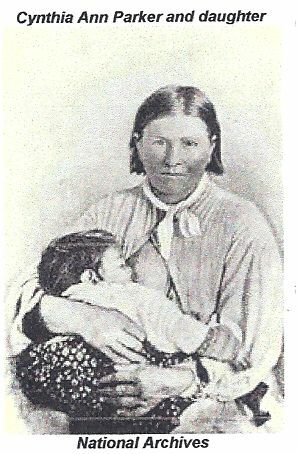 Cynthia Ann PARKER [Parents] was born in May 1825 in Of, Fort Parker, Limestone, Texas. She died on 28 Oct 1864 in , Anderson, Texas. She was buried in Post Oak Mission Cemetery, Indiahoma, Comanche, Oklahoma. Cynthia married Chief Peta Peutochonne NOCONA in 1844 in , , Texas. 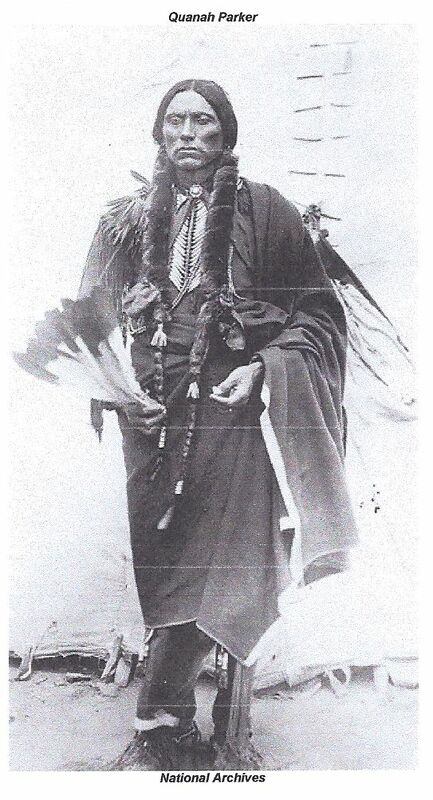 M i Quanah "Chief of the Nokonis" PARKER was born in 1845. He died on 23 Feb 1911. Pecos "Peanut" NOCONA was born in 1847 in , , Texas. He died in 1863. Cynthia PARKER was born about 1859 in Wichita Falls, Wichita, Texas. She died before 1925 in , , Oklahoma. Tau-Tai-Yah "Prairie Flower" NOCONA was born in 1862 in Staked Plains, Texas. She died in 1865 in Van Zandt, Texas. She was buried in Fort Sill, Comanche, Oklahoma. Wanderer. Wanderer married Cynthia Ann PARKER. Cynthia Ann PARKER [Parents] was born in May 1825 in Of, Fort Parker, Limestone, Texas. She died on 28 Oct 1864 in , Anderson, Texas. She was buried in Post Oak Mission Cemetery, Indiahoma, Comanche, Oklahoma. Cynthia married Wanderer. Quanah "Chief of the Nokonis" PARKER [Parents] was born in 1845 in Washita Mountain Region, , Texas, what is now Oklahoma. He died on 23 Feb 1911 in Cache, Comanche, Oklahoma. He was buried in 1911 in Post Oak Mission Cemetery, Fort Sill, Comanche, Oklahoma. Quanah married Whamimiha BEAR. Whamimiha BEAR [Parents] was born in 1853 in Indian Territory, , Oklahoma. She died in 1872. Whamimiha married Quanah "Chief of the Nokonis" PARKER. Quanah "Chief of the Nokonis" PARKER [Parents] was born in 1845 in Washita Mountain Region, , Texas, what is now Oklahoma. He died on 23 Feb 1911 in Cache, Comanche, Oklahoma. He was buried in 1911 in Post Oak Mission Cemetery, Fort Sill, Comanche, Oklahoma. Quanah married Mah-Cheeta-Wookey. Mah-Cheeta-Wookey was born about 1856 in Of, Seminole, Texas. She died on 2 Jan 1914. Mah-Cheeta-Wookey married Quanah "Chief of the Nokonis" PARKER. Quanah "Chief of the Nokonis" PARKER [Parents] was born in 1845 in Washita Mountain Region, , Texas, what is now Oklahoma. He died on 23 Feb 1911 in Cache, Comanche, Oklahoma. He was buried in 1911 in Post Oak Mission Cemetery, Fort Sill, Comanche, Oklahoma. Quanah married To-Nicy or Topay. To-Nicy or Topay was born in 1860. To-Nicy married Quanah "Chief of the Nokonis" PARKER. Quanah "Chief of the Nokonis" PARKER [Parents] was born in 1845 in Washita Mountain Region, , Texas, what is now Oklahoma. He died on 23 Feb 1911 in Cache, Comanche, Oklahoma. He was buried in 1911 in Post Oak Mission Cemetery, Fort Sill, Comanche, Oklahoma. Quanah married Chony. Chony. Chony married Quanah "Chief of the Nokonis" PARKER. Quanah "Chief of the Nokonis" PARKER [Parents] was born in 1845 in Washita Mountain Region, , Texas, what is now Oklahoma. He died on 23 Feb 1911 in Cache, Comanche, Oklahoma. He was buried in 1911 in Post Oak Mission Cemetery, Fort Sill, Comanche, Oklahoma. Quanah married Aeniorithtakun. Aeniorithtakun was born about 1856 in Of, Seminole, Texas. She died on 1 Jun 1948. Aeniorithtakun married Quanah "Chief of the Nokonis" PARKER. Quanah "Chief of the Nokonis" PARKER [Parents] was born in 1845 in Washita Mountain Region, , Texas, what is now Oklahoma. He died on 23 Feb 1911 in Cache, Comanche, Oklahoma. He was buried in 1911 in Post Oak Mission Cemetery, Fort Sill, Comanche, Oklahoma. Quanah married Wec-Keah. Wec-Keah [Parents] was born about 1848 in Of, Cache, Comanche, Oklahoma. She died in 1885 in Fort Worth, Tarrant, Texas. Wec-Keah married Quanah "Chief of the Nokonis" PARKER. F i Lauranedah PARKER was born about 1871. F ii Nau-Nocca PARKER was born in Dec 1873. She died on 26 Oct 1946. PARKER was born in 1875 in Indian Territory, Fort Sill, Comanche, Oklahoma. He died in 1875 in Fort Sill, Comanche, Oklahoma. Wea te ah PARKER was born in 1875 in Indian Territory, Fort Sill, Comanche, Oklahoma. He died in 1875 in Indian Territory, Fort Sill, Comanche, Oklahoma. Woonardy PARKER was born in 1877. Alice PARKER was born about 1878 in Indian Territory, Fort Sill, Comanche, Oklahoma. PARKER was born in 1878 in , , Texas. Baldwin PARKER was born in 1878 in , , Texas. Wer-Yoh-Ti PARKER was born in 1879. She died on 27 Jul 1965. PARKER was born in 1880 in , , Texas. Mary Pooche PARKER was born about 1881 in Indian Territory, Fort Sill, Comanche, Oklahoma. Infant PARKER was born in 1882 in , , Texas. PARKER was born in 1884 in Indian Territory, Fort Sill, Comanche, Oklahoma. He died in 1884 in Indian Territory, Fort Sill, Comanche, Oklahoma. Pache Mary PARKER was born in 1884 in Seminole, Gaines, Texas. PARKER was born in 1884 in , , Texas. Wah at ta PARKER was born in 1884 in Indian Territory, Fort Sill, Comanche, Oklahoma. He died in 1884 in Indian Territory, Fort Sill, Comanche, Oklahoma. Infant PARKER was born in 1884. PARKER was born in 1884 in Indian Territory, Fort Sill, Comanche, Oklahoma. She died in 1884 in Indian Territory, Fort Sill, Comanche, Oklahoma. PARKER was born in 1885 in Indian Territory, Fort Sill, Comanche, Oklahoma. He died in 1885 in Indian Territory, Fort Sill, Comanche, Oklahoma. Kelsey PARKER was born in 1885 in Indian Territory, , Oklahoma. PARKER was born in 1886 in Indian Territory, Fort Sill, Comanche, Oklahoma. She died in 1886 in Indian Territory, Fort Sill, Comanche, Oklahoma. Topeseup Alice Alice PARKER was born in 1886 in Seminole, Gaines, Texas. PARKER was born in 1887 in Indian Territory, Fort Sill, Comanche, Oklahoma. He died in 1887 in Indian Territory, Fort Sill, Comanche, Oklahoma. PARKER was born in 1889 in Indian Territory, Fort Sill, Comanche, Oklahoma. He died in 1889 in Indian Territory, Fort Sill, Comanche, Oklahoma. PARKER was born in 1890 in Indian Territory, Fort Sill, Comanche, Oklahoma. She died in 1890 in Indian Territory, Fort Sill, Comanche, Oklahoma. PARKER was born in 1891 in Indian Territory, Fort Sill, Comanche, Oklahoma. He died in 1891 in Indian Territory, Fort Sill, Comanche, Oklahoma. PARKER was born in 1892 in Indian Territory, Fort Sill, Comanche, Oklahoma. She died in 1892 in Indian Territory, Fort Sill, Comanche, Oklahoma. PARKER was born in 1892 in Indian Territory, Fort Sill, Comanche, Oklahoma. He died in 1892 in Indian Territory, Fort Sill, Comanche, Oklahoma. Chee PARKER was born in 1892 in Indian Territory, Fort Sill, Comanche, Oklahoma. PARKER was born in 1893 in Indian Territory, Fort Sill, Comanche, Oklahoma. She died in 1893 in Indian Territory, Fort Sill, Comanche, Oklahoma. Quanah "Chief of the Nokonis" PARKER [Parents] was born in 1845 in Washita Mountain Region, , Texas, what is now Oklahoma. He died on 23 Feb 1911 in Cache, Comanche, Oklahoma. He was buried in 1911 in Post Oak Mission Cemetery, Fort Sill, Comanche, Oklahoma. Quanah married Mrs. Quanah PARKER. Mrs. Quanah PARKER was born in 1844. Mrs. married Quanah "Chief of the Nokonis" PARKER.